Organization - ZhongDe Metal Group Co., Ltd. 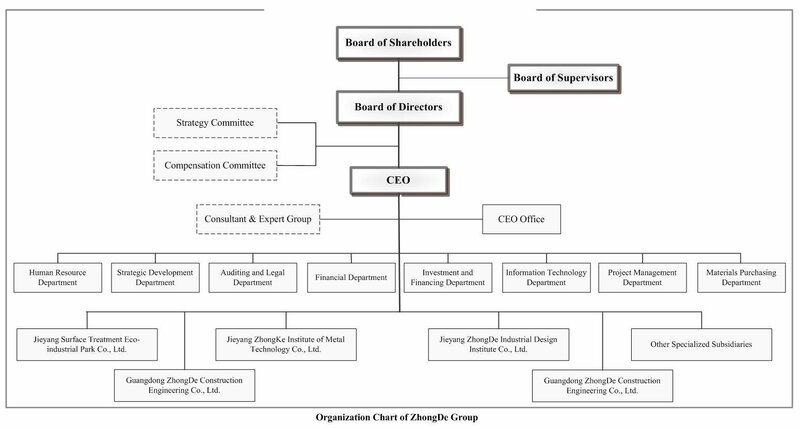 According to the management idea of ‘san hui yi ceng’(rules of procedure among board of shareholders, board of directors, board of supervisors and senior management), ZhongDe Metal Group establishes an organization chart with complete functions and a clear structure. In the aspect of operation, centering around the CEO, nine core functional departments are set up such as CEO Office, Human Resource Department, Strategic Development Department, Auditing and Legal Department, Financial Department, Investment and Financing Department, Information Technology Department, Project Management Department and Materials Purchasing Department. Besides, there are five subsidiary companies.